I'm so excited! I was driving by work the other day and the former Pearl Paint storefront is now being replaced by a Joann's Fabric store. We use to have Mood Fabric down the street but since that moved farther away, I've been lacking a good sewing and craft store. Now I have one within walking distance, woohoo! 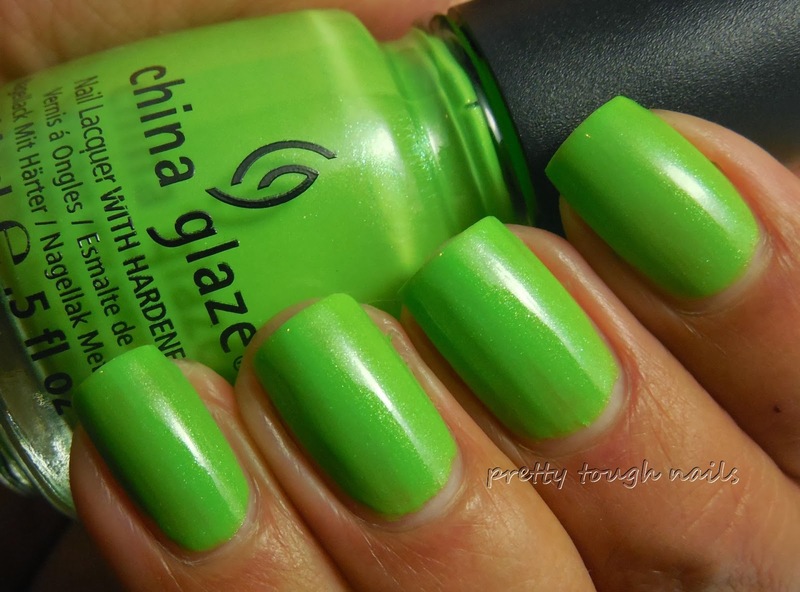 Today I felt like I needed a nice bright green to wear, which made me gravitate toward China Glaze Entourage. This was released as part of Summer 2009's Kicks collection, and it's a bright leafy green glass fleck shimmer. I used two coats and although it applied with some streakiness, it self leveled quickly. No topcoat in these pics. 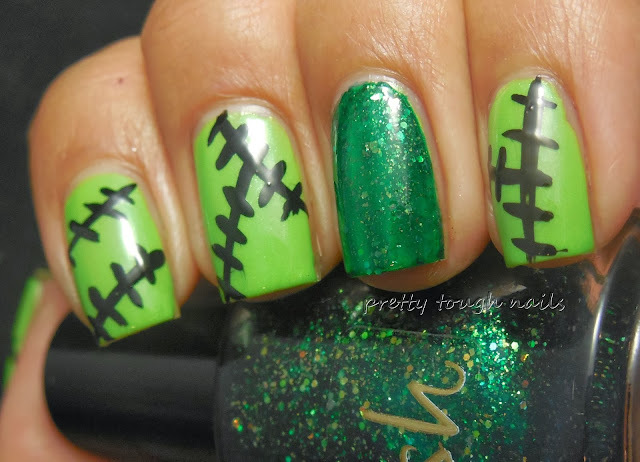 And what would be a perfect detail to add to this mani to make it Halloween appropriate? Black stitches! I used Wet N Wild black creme and a thin nail art brush to paint on the stitches. On my ring finger, I used a coat of Pahlish Still Alive, a shimmering emerald green with gold flecks. I thought the name was appropriate to go with the Frankenstein theme of this manicure. This is finished with a layer of NYC GSC. This was such a quick and easy nail art mani to create and the effect is delightfully juvenile and season appropriate. 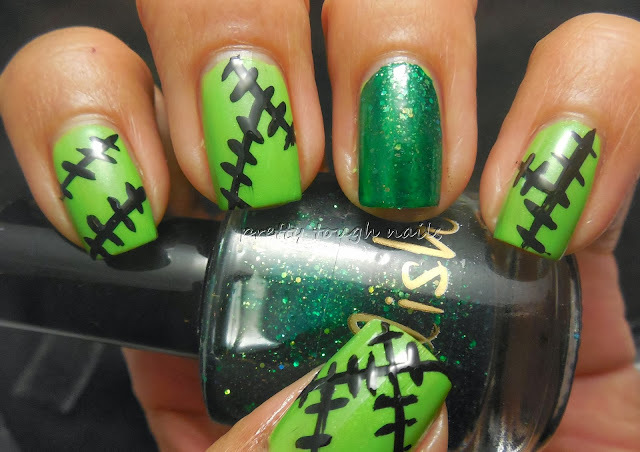 If I was really talented, I would have used different shades of green within the patches but I don't have that kind of foresight when planning nail art. I also was looking for a black glitter topper to go over Still Alive but my collection is lacking. Should have would have could have. Oh well! Hopefully this willinspire someone to create that vision for me. I love this mani! Entourage has been on my wishlist for some time. As for Still Alive, it's gorgeous! Halloween Spiders and Last Day for Giveaway! 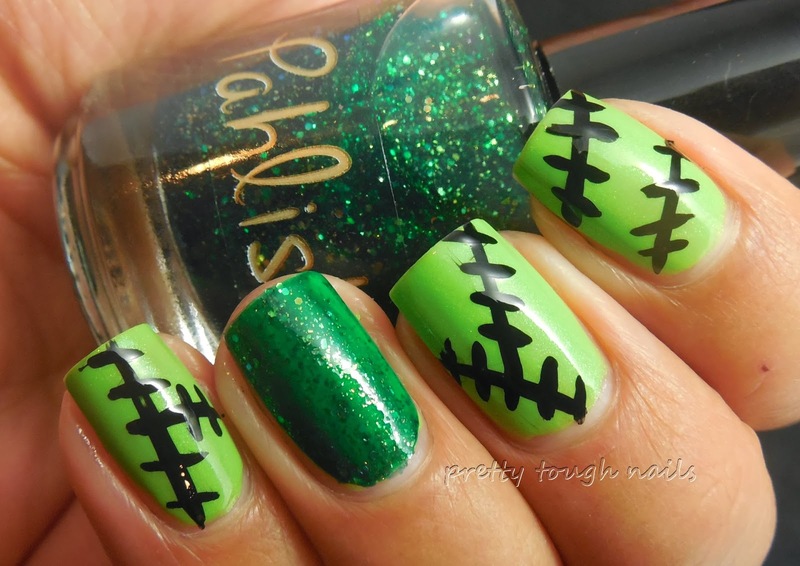 Hobby Polish Bloggers Halloween Giveaway! !